At least once in during your childhood--maybe at camp or on the bus for a field trip or during music class in elementary school or if you were a member of chorus--you have sung a song either written or made popular by Pete Seeger. The iconic banjo-playing singing activist has been credited with the folk music revival of the 60s and inspiring artists like Joan Baez, Bob Dylan and even Bruce Springsteen. His story is told in a documentary which was produced by, among others, his grandson Kitama Jackson and another noted rabble-rouser, Norman Lear. The documentary is a fairly perfunctory telling of the circumstances of Seeger's life: his musical roots (his father was a musicologist, his mother a concert violinist), his discovery of folk music, his schooling at Harvard, his leftist politics, his enduring marriage to Toshi-Aline Ohta, stints with the Almanac Singers and the Weavers, being blacklisted during the McCarthy era, etc. But what elevates it to a higher level is the music. Seeger was the writer or co-writer of classic songs like If I Had a Hammer, Where Have All the Flowers Gone?, Waist Deep in the Big Muddy and Turn, Turn, Turn, later covered and popularized by The Byrds. He popularized folk standards such as Michael Row the Boat Ashore, This Land is Your Land, This Little Light of Mine and most significantly, We Shall Overcome--which became the anthem for the Civil Rights movement. In his eighties, Seeger is still outspoken, still active (he SKIS!) and an activist--and still singing. But more than his accomplishments as an activist and agent of change, or for his song writing or musicianship, Pete Seeger is renown not just as a singer, but as a song leader. His performances are not just passive appreciation of American folk music but an active participation and expression of song. Seeger invites his audience to join in and sing along, turning a concert into a near evangelical experience with his belief that we can create community and find our salvation in music. 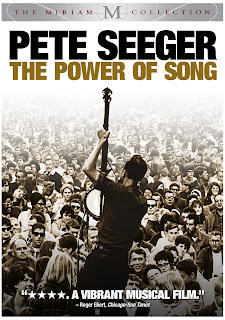 Pete Seeger: The Power of Song is available on DVD on August 5th. Definitely interested in watching it now. How are you, fellow Triiiber? Doing fine--thanks so much for checking out my blog!